Returning: Gotham, Arrow, The Originals. 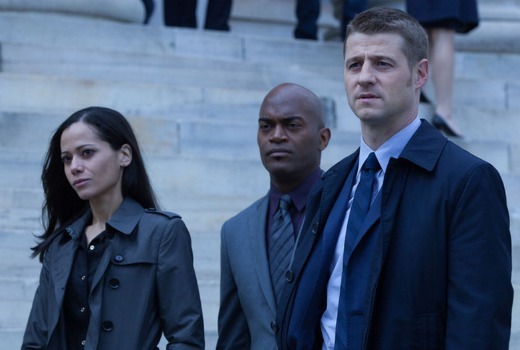 Gotham, Arrow and The Originals all return to GO! on Sunday May 17th. Trying to close the Wayne murder case, a young Harvey Dent encourages Gordon to team up with Mayor James. Meanwhile, Penguin makes contact with Mooney’s secret weapon, Liza. It will be followed by 2 new episodes of Arrow at 9.30pm kicking off Season Three. Lance calls the Arrow when another archer appears in town and starts skewering businessmen. Diggle uses A.R.G.U.S. to find the archer’s identity; he is a man named Simon Lacroix, who goes by the codename Komodo. Season 2 of The Originals airs from 11.30pm. As season two begins, after months of being holed up inside his compound, Klaus enlists the help of Elijah and Marcel in plotting his revenge against the Guerrera werewolves who now control the French Quarter. Channel GO make sure u keep arrow going for the whole season and put it at an earlier time slot and you will get more ratings. Put it on at 7 30 or 8 30 like u did in 2013 and if u put more ads for it people will watch the show. I actually don’t think they’ll do that. The Last Ship’s now aired 6 (of its 10) episodes without being replaced by BBT or movie repeats, albeit in the less competitive timeslot of 8.30 Wednesdays. So there is some hope to be had. Very excited I’d given up hope for the originals. Will be watching that whole nights line up, hope to see more of this on GO! Like it used to be in the old days. I’d give it a week before they go back to Big Bang repeats and recycled movies. GO never seems to give original content a chance. Rather odd they chose Sunday instead of a quieter Wednesday or Thursday night timeslot, but then again there isn’t much Sunday night drama on offer on the main channels at the moment. Wow, good to see but why all on the same night? Like each good enough for there own night, then they rub it in and put arrow on twice from 9:30 like what, are they on drugs, and arrow is ten times better then gotham, gothams finale yesterday was one of the worse eps of television I’ve ever seen, (thank god for vpn’s). Game up on Gotham on a weekly basis, happy to binge on Netflix when released but at the speed 9 shows them I’ll be waiting for a looooooong time. Would love it if this leads to a resurgence of scripted shows on the multis – well, scripted U.S. shows. However, I wouldn’t bet on that happening. How the hell does GO! still have rights to The Originals? That means FOX8 is airing the repeats! FOX8 should air the second season first! Yes, I don’t understand why GO! kept The Originals after dumping The Vampire Diaries. The end of the 1st season only got shown just before the rights ran out last year & Fox then screened it straight away. I wonder how long it will last until it is replaced by movies ? New episodes in prime time of programs other than Survivor on Go! – what is this madness?